Two very intelligent, very idealistic young women leave the convent school where they became the fastest of friends to return to their families and embark on their new lives. For Renée de Maucombe, this means an arranged marriage with a country gentleman of Provence, a fine if slightly dull man for whom she feels admiration but nothing more. Meanwhile, Louise de Chaulieu makes for her family’s house in Paris, intent on enjoying her freedom to the fullest: glittering balls, the opera, and above all, she devoutly hopes, the torments and ecstasies of true love and passion. What will come of these two very different lives? 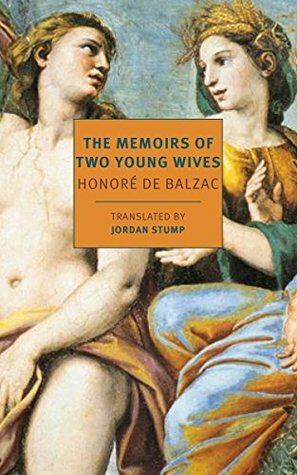 The Memoirs of Two Young Wives by Honoré de Balzac, (Jordan Stump translator) is a 2018 NYRB Classics publication. This book was originally published under the title Mémoires de deux jeunes mariées in 1841. When NYRB Classics sent out an email announcing the release of this classic epistolary novel, which is not, as the title suggests, a memoir, I was intrigued enough to request a purchase of it for my Overdrive library, which they were kind enough to do. What an interesting story! Told strictly via letters exchanged between two friends who met while attending a convent school together. They remained friends, throughout their entire lives, despite the very vast differences in the paths their lives took in adulthood. Renee chose a traditional life, marrying for comfort and companionship, to boost her husband’s morale and confidence, and for the pleasure of motherhood. Although she loves her husband in a way, theirs is not an all consuming love affair. Louise, lives for love, passion, society, and glamour. She is not in any way tempted by domesticity, nor does she display the slightest maternal instinct. She loves passionately, takes risks, attends social galas, and seems to love every minute of her dramatic life. But, she may pay a heavy toll for her choices. While each wife regales the other with their ups and downs, heartaches, trials, and triumphs, often urging each other to accept or acknowledge the benefits of the life they have chosen. The reader will see both sides clearly, and will, without much nudging from the author, decide which wife has made the best choice. Will they come to regret those decisions? Are they secretly envious of each other in big or small ways? Wistful perhaps? Which life would you choose to lead? Renee's or Louise's? This is a variant on the ‘coming of age’ trope, and while the story is tragic, what really stands out is the bond between Renee and Louise. They often disagree, go through long periods without correspondence, but love each other, despite the obvious chasms between them. I love my books, and really, really get involved with them on occasion, prompting me to do Google searches or ‘further reading’ if a topic interests me. In this case, I was a little afraid I might be completely out of my element, so I did a little research, and discovered some interesting facts about the book and the author, which was very helpful since I don’t ordinarily read French novels, although it seems I may be the only person on the planet unfamiliar with Balzac. Originally, this French language epistolary, was serialized in a French newspaper. It was first translated in 1902. It has been noted that the author did an amazing job of giving these women a voice, writing from the female perspective, with acute sensitivity for a man. He provided social commentary throughout and touched on the various forms of love, romance and marriage. 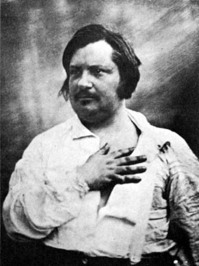 It is my understanding that compared to Balzac’s most famous work, this one barely made a blip when first published, but now, after taking it out and dusting off, it seems to be a rare and poignant discovery, even if it is not exactly what those familiar with his work are accustomed to. As for me, with nothing else to compare it to, I was thrilled to discover this ‘lost’ classic and happy to see that is now in digital format. It is a unique epistolary book, I am happy I took the time and extra effort to obtain. Needless to say, this has been an interesting, and pleasant learning experience for me. Although the story does end on a rather somber note, it does provoke thought and did indeed have me thinking about these two women, both of whom lived life on their own terms, for better or worse. I too am unfamiliar with Balzac's work, although I have heard of him. Thanks for this review. Thank you, Roland. I'm interested in reading more of his work, if I can find them in dependable translations. Have a great weekend, and thank you for visiting The Book Review!